Ariel Kachuro/Assistant Photography Editor Students gather outside the University Downtown Center to demand the removal of Laura Bronstein, dean of the College of Community and Public Affairs, and financial transparency from the school. 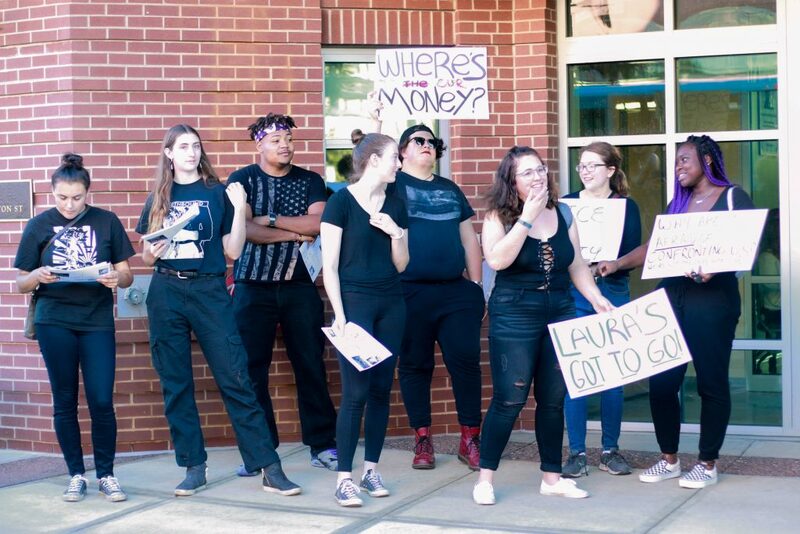 Donned in black clothing, students gathered at the Binghamton University Downtown Center (UDC) to protest the second annual University Downtown Gala on Friday evening. The students had three demands: complete transparency as to where the money from the fundraiser would be going, the immediate removal of Laura Bronstein, dean of the College of Community and Public Affairs (CCPA), and complete transparency as to what happened to the money from the failed 2017 Blue Light Initiative. The protest consisted of a coalition of students, including members of the Frances Beal Society, College Progressives, Black Student Union and the Human Development Emancipation and Activism Taskforce (HEAT). According to Bryce Lawson, president of College Progressives and a senior majoring in business administration, the demonstration was a continuation of efforts that started last spring with the UDC protests and in 2017 with the Blue Light Initiative protests. In spring 2018, students posted flyers at the UDC that condemned racism on campus and criticized the University administration’s lack of action against racist incidents. Police responded to the flyering, which prompted a protest at the UDC. Bronstein was invited to talk with students at the protest, but did not attend. The previous year, students protested the Blue Light Initiative, a project submitted by the Roosevelt Institute and led by BU that would set up blue light call boxes and cameras in the greater Binghamton area. “The University has a very large hand in gentrifying Binghamton proper so finding out where this money is going [is important] because people in the community that are supposed to be benefiting from this never know where this money is going, and sometimes those initiatives that the University comes with are harmful [to] the community,” Lawson said. According to the gala’s event page, the purpose of the fundraiser was to celebrate community partnerships, student achievement and faculty research within CCPA. Nick Terepka, a senior majoring in sociology, said the student groups want to hold the University accountable due to the administration’s lack of transparency in the past. “They’re saying the money is going toward CCPA initiatives, but they’re not specific about it and based off of previous attempts of the University to try and do things in the community, we don’t trust them with that, specifically with the Blue Light protest,” Terepka said. Protestors stood outside both the front and back entrances to the gala, passing out flyers to guests as they arrived. In addition to the coalition, several professors attended the protest. Lubna Chaudhry, an associate professor of human development, said she attended to support her students and their demands. According to Ryan Yarosh, senior director of media and public relations at BU, the University encourages students to express their opinions and right to protest.